Striker Michael Higdon hopes Motherwell can make the most of leapfrogging Inverness CT on Saturday. Celtic's Anthony Stokes feels he is making up for lost time after netting three goals in his last four appearances. Manager Stuart McCall says that he expects to sign a new contract at Motherwell very soon. Celtic boss Neil Lennon highlights the character shown by scorer Efe Ambrose in the 6-2 rout of Dundee United. Manager Kenny Shiels is full of praise for hat-trick hero Paul Heffernan after Kilmarnock's 3-0 win at Hearts. St Mirren manager Danny Lennon is left frustrated after a below-par display by his team leads to a home defeat by Hibs. Kris Commons and Anthony Stokes each score twice as Celtic rout Dundee United and stretch their SPL advantage. 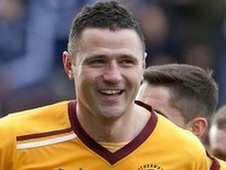 Michael Higdon scores twice as Motherwell leapfrog Inverness CT into second place in the Scottish Premier League. Steven May scores twice as Hamilton claim a draw against First Division bottom club Airdrie United. First Division leaders Morton maintain their eight-point advantage over Partick Thistle by coming from two goals down to draw with the Jags. Michael Moffat scores a hat-trick as Ayr United comfortably beat Second Division bottom club Albion Rovers. Leaders Rangers strengthen their grip on the Third Division with a very comfortable victory away to Clyde.